“I… I just don’t like to talk about it”, my student told me. It was our first Orientation and Mobility (O&M) class together. He was about 15 years old with the degenerative eye condition, Retinitis Pigmentosa (RP). For people with RP, there is a significant chance that they will eventually lose most of their vision. Vision is worse at night, often resulting in night blindness before losing their peripheral fields. As we sat facing one another in the principal’s conference room, I asked him what he envisioned for his future. His once jolly smile turned into a saddened face. He looked down and suddenly began avoiding eye contact. “I don’t know, I think I will always be with somebody”, he said. Describing what he thought his night-time travel needs might look like in 10 years. “Even as an adult?”, I probed. Here I was, a stranger without a visual impairment, trying desperately to casually bring up the forbidden “C” word; CANE. There have been many of these instances in my career. I’m a person who doesn’t have a visual impairment, and yet I am pushing boundaries. Their boundaries. The boundaries of what they think they can do; the boundaries of what their family members think they can do. Sometimes I even push the boundaries of the perceptions of what their community members think they can do. It’s my job to push the boundaries of my students’ independence level and get them out of their comfort zone. That does not come without its own fair share of push-back. Supporting the independence of people with visual impairments when you are not blind yourself is a delicate balance. A balance between knowing when to push those boundaries, and knowing when to sit quietly. When we are new to our students we are still outsiders who have not yet earned their trust. We know that even though we have no pity for anyone, our sympathy is not empathy. We don’t actually know what it is like to live with a visual impairment every single moment of the day. President Roosevelt once said, “Nobody cares how much you know until they know how much you care”. We must remember everybody goes through cycles where they’re dealing with the stages of grief. Even those who have been blind since birth. We also must remember the student and their loved ones may be on different parts of this cycle at any given time. We must remember that building relationships and trust can take a long time. When we only see a student once a month, this can take a lot of persistence to overcome. We are outsiders coming into their inner circle. Sometimes the pushback we receive is simply because we haven’t yet proven our worthiness. Most of all, we must remember while we’re both cheerleaders and coaches to our students’ independence, we’re NOT the quarterbacks. We cannot do the work for them. We can teach them the skills. We can coach them to make that big play. We can cheer them on from the sidelines. We can even get their water-filled after the game. BUT, we cannot make the moves for them. Ultimately, this is THEIR independence; not ours. Each and every O&M Specialist in this field care about each and every one of you. We may be pushy. We may be bold in our attempts. And we may step on your toes. But overall, it is out of a deep sense of caring for you and your independence. For most of us, the privilege of sight is actually a burden in our careers. We know that even though we have no pity for anyone, our sympathy is not empathy. We don’t actually know what it is like to live with a visual impairment every single moment of the day. It is our joy to help support the independence of people with visual impairments. And it’s our passion to see every person with a visual impairment live their most independent, successful, and fulfilled lives. I hope this gives some insight into how we try to support the independence of people with visual impairments. Leave a comment and share your story. I would love to hear your thoughts on this subject! 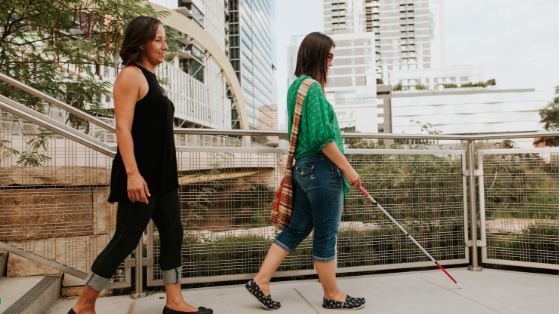 Kassy during an O&M session is walking behind her student who is learning to navigate with the white cane. Both brunettes with shoulder-length hair are casually dressed in jeans and flats. Kassy is wearing a black tank top and her student is wearing a green top. Some green foliage and city buildings can be seen in the background. It looks like they just came down a set of cement stairs. Kassy is smiling while sitting in a chair with her left arm casually propped against the chair’s back. She is wearing a black cami with a rose-colored skirt and gold medallion around her neck. I am so grateful to the P&M teachers in my life. I didn’t fully realize how important these skills were until I went to graduate school in a big city. Thanks for inspiring other students! Very powerful and inspirational story! Thanks for posting and sharing it!